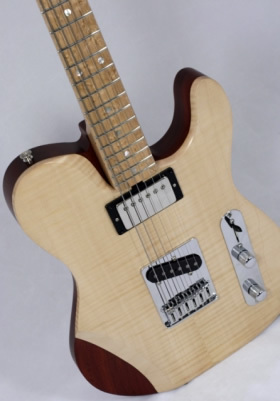 A David Antony Reid Hybrid Electric guitar. For years now I've been interested in making an electric guitar but I've never found pickups that impressed me enough, so I wasn't happy with putting my name to an electric instrument. 'Bare Knuckle Pickups' have changed all that! This guitar is ready for testing so get in touch to try out these awesome pups! You can either visit me at home where I have a 'Blackstar HT5' valve amp, or at my studio where there's a 100 watt 'Marshall', and you can crank it right up there!! I've chosen the 'Riff-Raff' humbucker, and the 'Piledriver' single coil because I love plenty of grunt; but, if you role them off a little the tone is sweet and pure. I've also coil-tapped the humbucker too so you can produce five very different tones with these two pickups thanks to a push-pull volume pot. I've used a vitamin Q oil and paper capacitor, 'CTS' pots and an 'Oak Grigsby' switch. This instrument is NOT for sale, however, after enthusiastic interest I've been encouraged to make one which shall be. 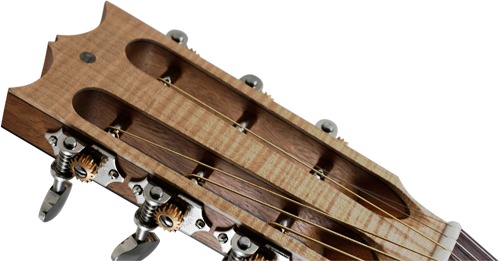 I intend on using a slotted headstock on it but fully intend to stay with most of the other styling and materials used on this current instrument. For many more images of this David Antony Reid electric Hybrid check out my gallery. Also, for more info on Bare Knuckle Pickups check out the previous project on this page.